Billy Wilder gave away the climax to his movies more than most directors. All it took was 2 or 3 minutes of Sunset Boulevard and Double Indemnity to know where the movies were going. 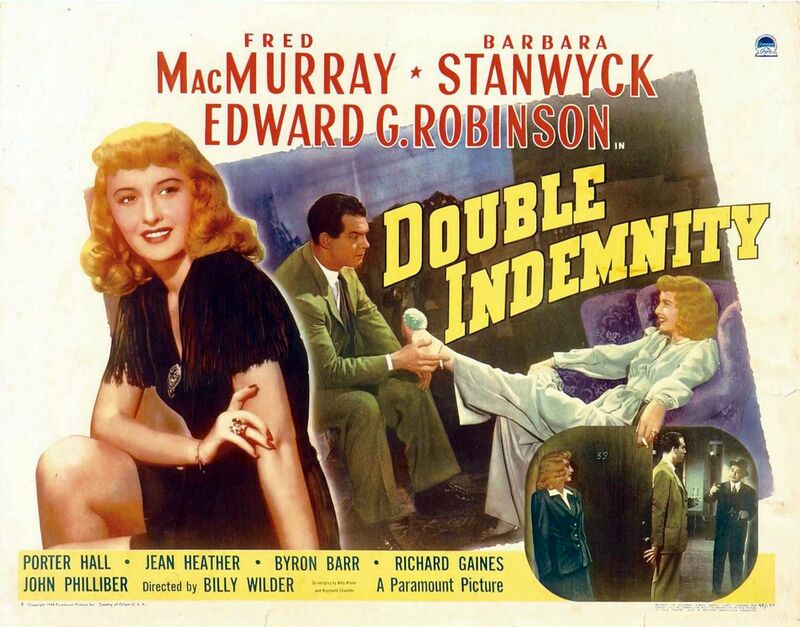 Double Indemnity starts off with scummy insurance salesman Walter Neff (Fred MacMurray) racing to his office with a gunshot wound. Rather than leave town or get medical treatment, he is compelled to confess his crimes. Then we see why somebody would shoot this rather dull fellow. This framing device wasn’t as common in 1944 as it is now, so kudos to Wilder for making it work so well. Maybe Neff doesn’t just blow town because he’s in love with his semi-genius co-worker Barton Keyes (Edward G. Robinson) and needs closure on that relationship. Okay, they’re not in love sexually, but this is one of hundreds of great movies that—if you think about it—feature a bromance that overshadows any man/woman attachments. As outstanding as the outstanding Barbara Stanwyck is as the fatal femme fatale, the real story is the strong friendship betwixt Neff and Keyes. Wilder’s story (co-written with Raymond Chandler, adapted from James Cain’s novella) is luridly delicious. Neff meets married Phyllis Dietrichson (Stanwyck) on a visit to renew her husband’s insurance policy. They decide to make sure her hubbie has an “accident” so they can make off with a big payday. Keyes, however, is smarter than the gullible cops and he won’t let the case go. He doesn’t KNOW that Mr. Dietrichson was murdered, but he’s going to figure it out. Meanwhile, Walter and Phyllis don’t trust each other. The American Film Institute loves Double Indemnity almost as much as I do, proving that by ranking it 38th in 1998 and then 29th in 2007 on their Top 100 lists. Not bad for “The Insurance Movie”! The AFI appreciates it as a thriller and as a love story too, even if it’s hard to believe that Walter and Phyllis ever had any real feelings for one another. She’s rotten to the core and he’s too horny to notice until it’s too late. It’s pulp and it certainly isn’t the most uplifting movie made during WWII, but I smile just thinking about how bad these people are.